Earn $48.27 in Rewards credit (4827 points) What's This? 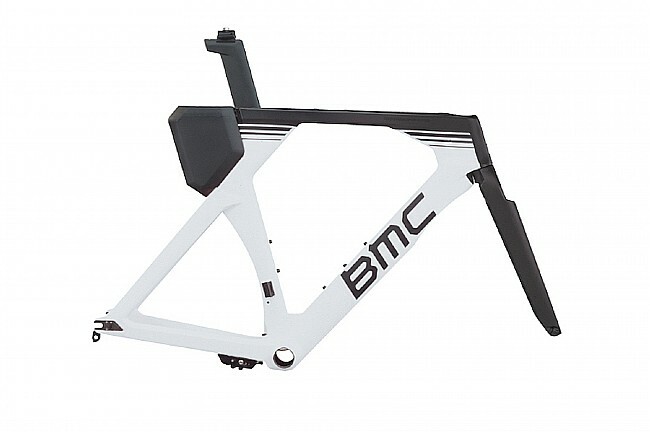 BMC’s 2018 Timemachine TM02 Frameset is constructed of Aerodynamic 02 Premium Carbon featuring an aero-optimized fork, 3:1 tubes with truncated profiles, and crosswind-stable tube shapes, making it the perfect machine for mid- and long-distance triathlons or time trials. Its Position-to-Perform (P2P) system allows the rider to customize saddle positioning without compromising aerodynamics. The traditional steerer tube offers versatility in cockpit setup. Top tube mounts for fuel box. Down tube mounts for 2 bottle cages. Frame: Standard QR 130mm, horizontal, adjustable dropouts. Fork: Standard QR 100mm, untapered steerer 1-1/8”. Seatpost: P2P Dual-Mount Aeropost 01 Premium Carbon.